State corporation commission; creation; members, appointment, terms, vacancies; chairperson; salaries; application of K-GOAL. Download "74-601. State corporation commission; creation; members, appointment, terms, vacancies; chairperson; salaries; application of K-GOAL." 2 are hereby transferred to and imposed and conferred upon the state corporation commission created under the provisions of this act, and the state corporation commission herein created is hereby empowered and directed to do all things necessary and convenient for the proper exercise of all such powers, duties, authority and jurisdiction. History: L. 1933, ch. 275, 3; March Corporation commission; qualifications and oaths of members, secretary and attorney; extra employees. No person owning any bonds, stock or property in any railroad company or other common carrier or public utility, or who is in the employment of, or who is in any way or manner pecuniarily interested in, any railroad company or other common carrier or public utility, shall be eligible, except as hereinafter provided, to the office of commissioner, attorney or secretary of said commission, nor shall such commissioner, attorney or secretary hold any office of profit or any position under any committee of any political party, or hold any other position of honor, profit or trust under or by virtue of any of the laws of the United States or of the state of Kansas. Said commissioners shall be qualified electors of the state, and shall not while such commissioners engage in any occupation or business inconsistent with their duties as such commissioners. And if any member of the commission, at the time of his appointment, shall own any bonds, stock or property in any railroad company or other common carrier or public utility, or is in the employment of, or is in any way or manner pecuniarily interested in any railroad company or any common carrier or public utility, such commissioner or other appointee shall within thirty (30) days divest himself of such interest or employment, and upon his failing to do so he shall forfeit his office, and the governor shall remove such commissioner and shall appoint his successor, who shall hold until a successor is appointed and qualified. Each of said commissioners, attorney and secretary shall be sworn, before entering upon the discharge of the same, to faithfully perform the duties of the respective offices. Said commission is authorized and empowered to employ, subject to the approval of the governor, such extra accountants, engineers, experts and special assistants as in its judgment may be necessary and proper to carry the provisions of this act into effect, and to fix their compensation; and such employees shall hold their office during the pleasure of said commission: Provided, That no person related by blood or marriage to any member of such commission shall be appointed or employed by said commission. History: R.S. 1923, ; L. 1967, ch. 434, 23; July a. Same; oaths of members. The members of the state corporaton commission shall take the oath required for other state officers. History: L. 1933, ch. 275, 5; L. 1967, ch. 434, 24; July Corporation commission main office in Topeka, conservation division in Wichita; director, petroleum engineer and interagency coordinator of division unclassified. The state corporation commission shall keep its office in the city of Topeka, and the office of the conservation division in the city of Wichita and the members thereof may act officially in any part of the state. The director of the conservation division of the state corporation commission shall be in the unclassified service under the Kansas civil service act. The petroleum engineer and interagency coordinator within the conservation division of the state corporation commission shall be in the unclassified service under the Kansas civil service act. History: L. 1933, ch. 275, 6; L. 1957, ch. 442, 6; L. 1981, ch. 298, 1; L. 1994, ch. 1, 1; July Same; records; seal; copies as evidence. Said corporation commission shall keep an accurate record of all its official acts, and shall also provide a seal. All process or certificates issued or given by the said commission shall be attested by its seal. Copies of the record of the commission, certified by the secretary and attested with the seal of the commission, shall be received in evidence with like effect as copies of other public records. History: R.S. 1923, ; Dec State corporation commission; certain professional employees of utilities division in unclassified service. On and after the effective date of this act, all engineers, auditors, accountants, rate analysts, economists and similar professional employees within the utilities division of the state corporation commission shall be in the unclassified service under the Kansas civil service act. History: L. 1979, ch. 236, 1; April 24. 3 State corporation commission; director of transportation division in unclassified service. The director of the transportation division of the state corporation commission shall be in the unclassified service under the Kansas civil service act. History: L. 1980, ch. 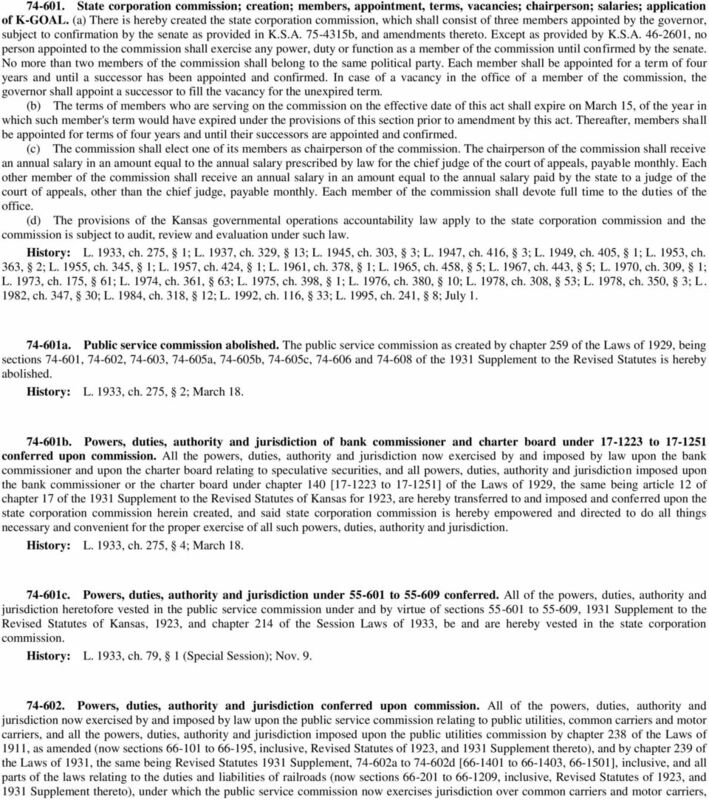 200, 4; July State corporation commission; powers and duties relating to energy resources. 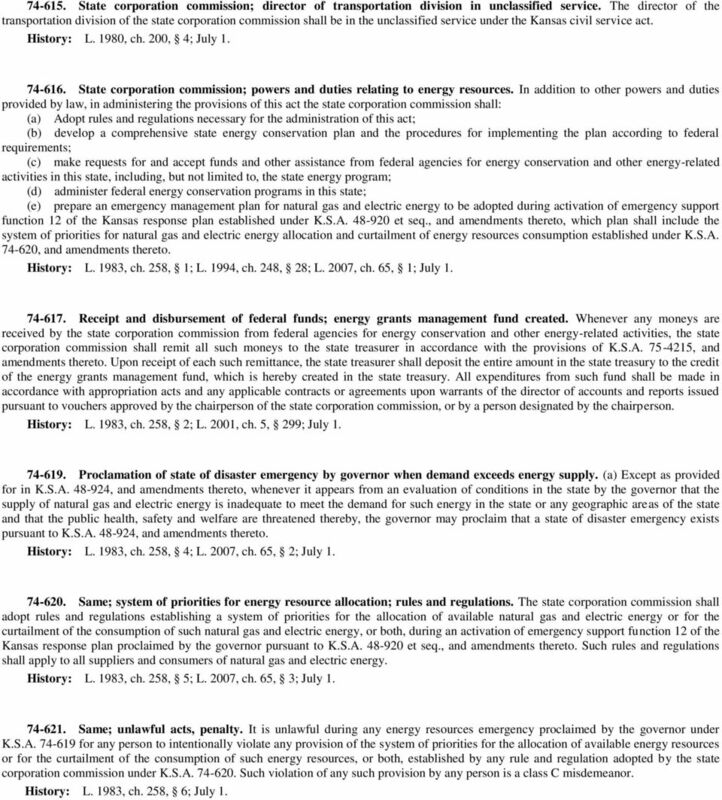 In addition to other powers and duties provided by law, in administering the provisions of this act the state corporation commission shall: (a) Adopt rules and regulations necessary for the administration of this act; (b) develop a comprehensive state energy conservation plan and the procedures for implementing the plan according to federal requirements; (c) make requests for and accept funds and other assistance from federal agencies for energy conservation and other energy-related activities in this state, including, but not limited to, the state energy program; (d) administer federal energy conservation programs in this state; (e) prepare an emergency management plan for natural gas and electric energy to be adopted during activation of emergency support function 12 of the Kansas response plan established under K.S.A et seq., and amendments thereto, which plan shall include the system of priorities for natural gas and electric energy allocation and curtailment of energy resources consumption established under K.S.A , and amendments thereto. History: L. 1983, ch. 258, 1; L. 1994, ch. 248, 28; L. 2007, ch. 65, 1; July Receipt and disbursement of federal funds; energy grants management fund created. Whenever any moneys are received by the state corporation commission from federal agencies for energy conservation and other energy-related activities, the state corporation commission shall remit all such moneys to the state treasurer in accordance with the provisions of K.S.A , and amendments thereto. Upon receipt of each such remittance, the state treasurer shall deposit the entire amount in the state treasury to the credit of the energy grants management fund, which is hereby created in the state treasury. All expenditures from such fund shall be made in accordance with appropriation acts and any applicable contracts or agreements upon warrants of the director of accounts and reports issued pursuant to vouchers approved by the chairperson of the state corporation commission, or by a person designated by the chairperson. History: L. 1983, ch. 258, 2; L. 2001, ch. 5, 299; July Proclamation of state of disaster emergency by governor when demand exceeds energy supply. (a) Except as provided for in K.S.A , and amendments thereto, whenever it appears from an evaluation of conditions in the state by the governor that the supply of natural gas and electric energy is inadequate to meet the demand for such energy in the state or any geographic areas of the state and that the public health, safety and welfare are threatened thereby, the governor may proclaim that a state of disaster emergency exists pursuant to K.S.A , and amendments thereto. History: L. 1983, ch. 258, 4; L. 2007, ch. 65, 2; July Same; system of priorities for energy resource allocation; rules and regulations. The state corporation commission shall adopt rules and regulations establishing a system of priorities for the allocation of available natural gas and electric energy or for the curtailment of the consumption of such natural gas and electric energy, or both, during an activation of emergency support function 12 of the Kansas response plan proclaimed by the governor pursuant to K.S.A et seq., and amendments thereto. Such rules and regulations shall apply to all suppliers and consumers of natural gas and electric energy. History: L. 1983, ch. 258, 5; L. 2007, ch. 65, 3; July Same; unlawful acts, penalty. It is unlawful during any energy resources emergency proclaimed by the governor under K.S.A for any person to intentionally violate any provision of the system of priorities for the allocation of available energy resources or for the curtailment of the consumption of such energy resources, or both, established by any rule and regulation adopted by the state corporation commission under K.S.A Such violation of any such provision by any person is a class C misdemeanor. History: L. 1983, ch. 258, 6; July 1. 4 Kansas energy office abolished; state corporation commission, successor; transfer of appropriations, records, employees; continuation of effect of rules and regulations and orders and directives. (a) On July 1, 1983, the unexpended balances of any appropriations for and funds available to the Kansas energy office abolished under this act are hereby transferred to the state corporation commission to be used for the purpose of implementing the provisions of this act. (b) On July 1, 1983, all records and property of the Kansas energy office abolished under this act are hereby transferred to and conferred and imposed upon the state corporation commission. (c) Whenever the Kansas energy office, or words of like effect, is referred to or designated by a contract, grant or other document, such reference or designation shall be deemed to apply to the state corporation commission. 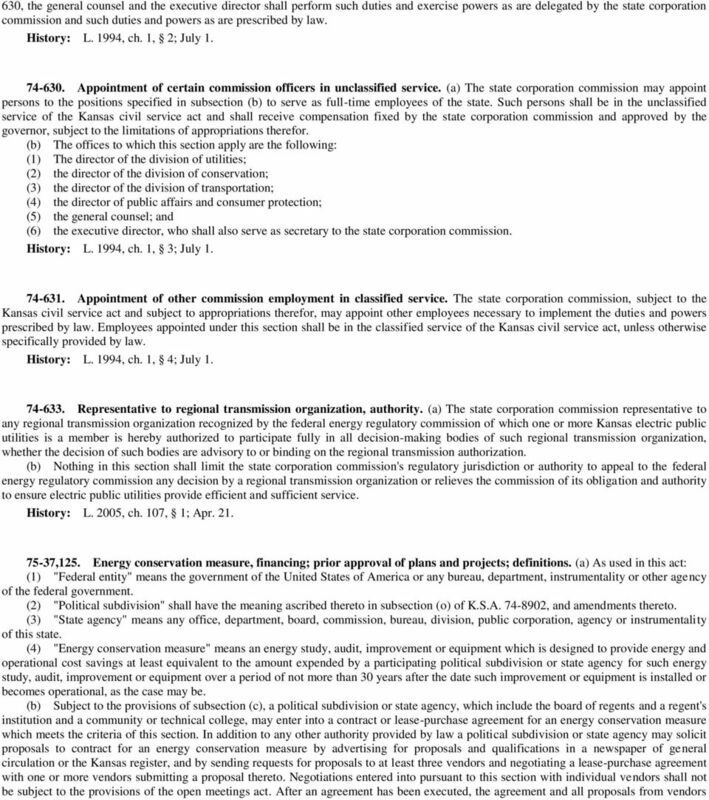 Whenever the director of the Kansas energy office, or words of like effect, is referred to or designated by a contract, grant or other document, such reference or designation shall be deemed to apply to the state corporation commission. All awards or grants made by the director of the Kansas energy office, which are in effect on July 1, 1983, shall continue to be effective for the duration of the period for which they were made, unless revised or nullified in accordance with law. All contracts entered into by the director of the Kansas energy office prior to July 1, 1983, and not fully executed on such date, shall remain in full force and effect until fully executed or until terminated or revoked in the manner provided in such contract or as is otherwise provided by law on the date of such contract. 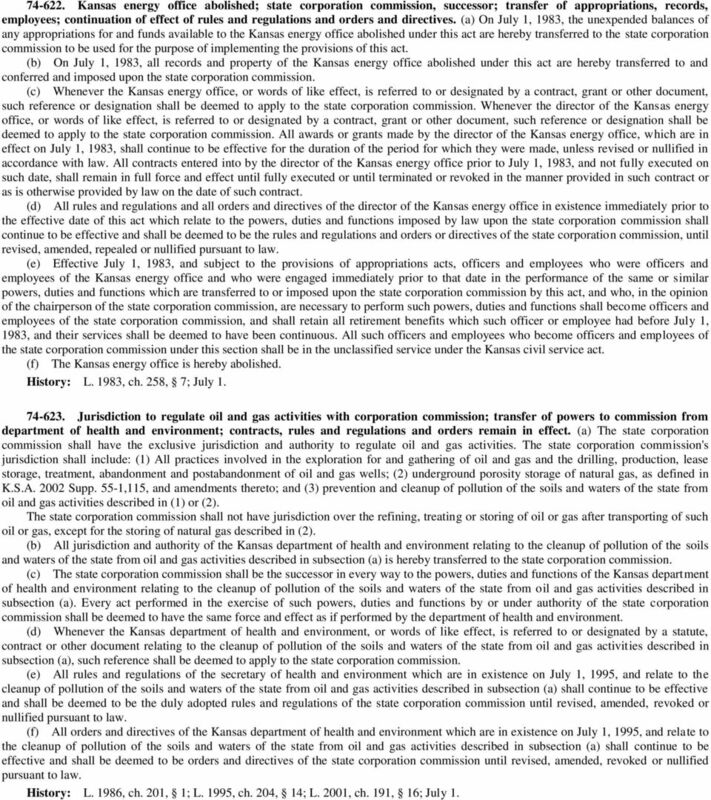 (d) All rules and regulations and all orders and directives of the director of the Kansas energy office in existence immediately prior to the effective date of this act which relate to the powers, duties and functions imposed by law upon the state corporation commission shall continue to be effective and shall be deemed to be the rules and regulations and orders or directives of the state corporation commission, until revised, amended, repealed or nullified pursuant to law. (e) Effective July 1, 1983, and subject to the provisions of appropriations acts, officers and employees who were officers and employees of the Kansas energy office and who were engaged immediately prior to that date in the performance of the same or similar powers, duties and functions which are transferred to or imposed upon the state corporation commission by this act, and who, in the opinion of the chairperson of the state corporation commission, are necessary to perform such powers, duties and functions shall become officers and employees of the state corporation commission, and shall retain all retirement benefits which such officer or employee had before July 1, 1983, and their services shall be deemed to have been continuous. 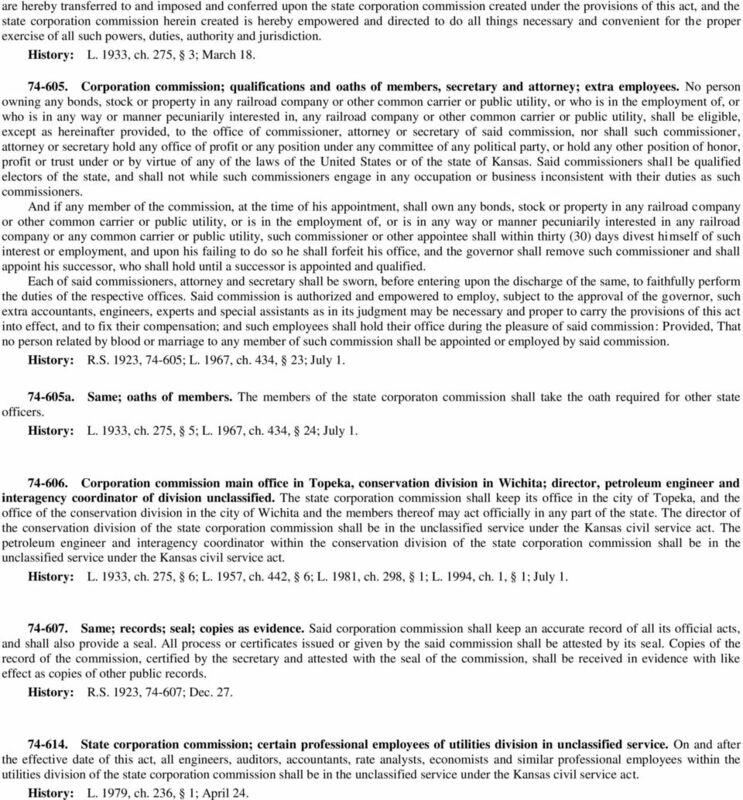 All such officers and employees who become officers and employees of the state corporation commission under this section shall be in the unclassified service under the Kansas civil service act. (f) The Kansas energy office is hereby abolished. History: L. 1983, ch. 258, 7; July Jurisdiction to regulate oil and gas activities with corporation commission; transfer of powers to commission from department of health and environment; contracts, rules and regulations and orders remain in effect. (a) The state corporation commission shall have the exclusive jurisdiction and authority to regulate oil and gas activities. The state corporation commission's jurisdiction shall include: (1) All practices involved in the exploration for and gathering of oil and gas and the drilling, production, lease storage, treatment, abandonment and postabandonment of oil and gas wells; (2) underground porosity storage of natural gas, as defined in K.S.A Supp. 55-1,115, and amendments thereto; and (3) prevention and cleanup of pollution of the soils and waters of the state from oil and gas activities described in (1) or (2). The state corporation commission shall not have jurisdiction over the refining, treating or storing of oil or gas after transporting of such oil or gas, except for the storing of natural gas described in (2). (b) All jurisdiction and authority of the Kansas department of health and environment relating to the cleanup of pollution of the soils and waters of the state from oil and gas activities described in subsection (a) is hereby transferred to the state corporation commission. (c) The state corporation commission shall be the successor in every way to the powers, duties and functions of the Kansas department of health and environment relating to the cleanup of pollution of the soils and waters of the state from oil and gas activities described in subsection (a). Every act performed in the exercise of such powers, duties and functions by or under authority of the state corporation commission shall be deemed to have the same force and effect as if performed by the department of health and environment. (d) Whenever the Kansas department of health and environment, or words of like effect, is referred to or designated by a statute, contract or other document relating to the cleanup of pollution of the soils and waters of the state from oil and gas activities described in subsection (a), such reference shall be deemed to apply to the state corporation commission. (e) All rules and regulations of the secretary of health and environment which are in existence on July 1, 1995, and relate to the cleanup of pollution of the soils and waters of the state from oil and gas activities described in subsection (a) shall continue to be effective and shall be deemed to be the duly adopted rules and regulations of the state corporation commission until revised, amended, revoked or nullified pursuant to law. 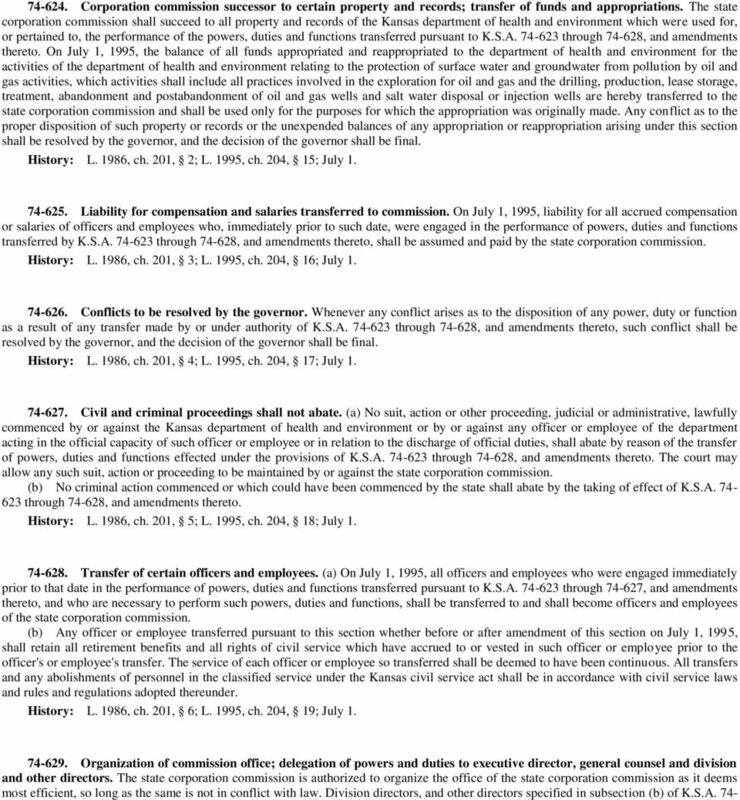 (f) All orders and directives of the Kansas department of health and environment which are in existence on July 1, 1995, and relate to the cleanup of pollution of the soils and waters of the state from oil and gas activities described in subsection (a) shall continue to be effective and shall be deemed to be orders and directives of the state corporation commission until revised, amended, revoked or nullified pursuant to law. History: L. 1986, ch. 201, 1; L. 1995, ch. 204, 14; L. 2001, ch. 191, 16; July 1. 7 shall be open records available for public inspection in accordance with the open records act. A state agency may utilize the procedures prescribed in K.S.A ,102, and amendments thereto, by the procurement negotiating committee to negotiate and contract for energy conservation measures. Each state agency shall provide copies of plans of the proposed energy conservation measure to the state corporation commission for review. No state agency may enter into a contract for an energy conservation measure unless such measure has been approved by the state corporation commission. Plans submitted under this section shall be retained and maintained by the state corporation commission. 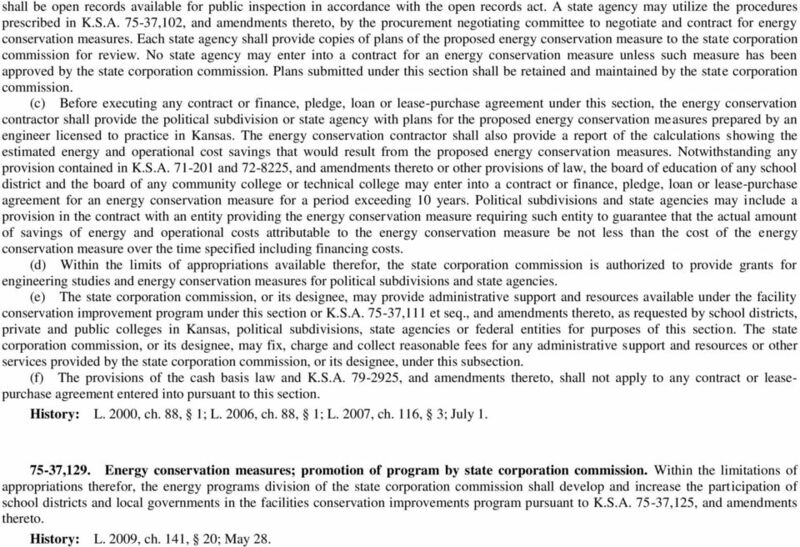 (c) Before executing any contract or finance, pledge, loan or lease-purchase agreement under this section, the energy conservation contractor shall provide the political subdivision or state agency with plans for the proposed energy conservation measures prepared by an engineer licensed to practice in Kansas. The energy conservation contractor shall also provide a report of the calculations showing the estimated energy and operational cost savings that would result from the proposed energy conservation measures. Notwithstanding any provision contained in K.S.A and , and amendments thereto or other provisions of law, the board of education of any school district and the board of any community college or technical college may enter into a contract or finance, pledge, loan or lease-purchase agreement for an energy conservation measure for a period exceeding 10 years. Political subdivisions and state agencies may include a provision in the contract with an entity providing the energy conservation measure requiring such entity to guarantee that the actual amount of savings of energy and operational costs attributable to the energy conservation measure be not less than the cost of the energy conservation measure over the time specified including financing costs. (d) Within the limits of appropriations available therefor, the state corporation commission is authorized to provide grants for engineering studies and energy conservation measures for political subdivisions and state agencies. (e) The state corporation commission, or its designee, may provide administrative support and resources available under the facility conservation improvement program under this section or K.S.A ,111 et seq., and amendments thereto, as requested by school districts, private and public colleges in Kansas, political subdivisions, state agencies or federal entities for purposes of this section. The state corporation commission, or its designee, may fix, charge and collect reasonable fees for any administrative support and resources or other services provided by the state corporation commission, or its designee, under this subsection. (f) The provisions of the cash basis law and K.S.A , and amendments thereto, shall not apply to any contract or leasepurchase agreement entered into pursuant to this section. History: L. 2000, ch. 88, 1; L. 2006, ch. 88, 1; L. 2007, ch. 116, 3; July ,129. Energy conservation measures; promotion of program by state corporation commission. Within the limitations of appropriations therefor, the energy programs division of the state corporation commission shall develop and increase the participation of school districts and local governments in the facilities conservation improvements program pursuant to K.S.A ,125, and amendments thereto. History: L. 2009, ch. 141, 20; May 28. KANSAS DEPARTMENT ON AGING Statutes and Regulations for the Licensure and Operation of Nursing Facilities Print Date:. NOTICE: Print date is the date this copy of the Statutes and Regulations was printed. Agency 56 State of Kansas Office of the Adjutant General Articles 56-1. ARMORIES. 56-2. STANDARDS FOR LOCAL DISASTER AGENCIES. 56-3. NUCLEAR EMERGENCY PREPAREDNESS FEES. Article 1. ARMORIES 56-1-1. Definitions.